The Heritage City of Meknes has exerted a considerable influence on the development of the civil and military architecture and works of art. The name of Meknes goes back to the Meknassa, the great Berber tribe that dominated eastern Morocco to as far as the Tafililet and which produced Moulay ldriss I, founder of the Moroccan state and the ldrissid dynasty in the 8th century AD. The Almoravid rulers (1053-1147) made a practice of building strongholds for storing food and arms for their troops; this was introduced by Youssef Ben Tachafine, the founder of Marrakech. 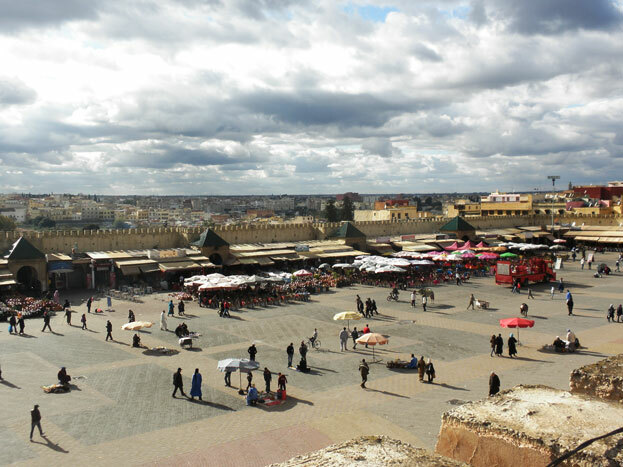 Meknes was established in this period, at first bearing the name Tagrart. The earliest part to be settled was around the Nejjarine mosque, an Almoravid foundation. Markets congregated around the mosque, specializing in firearms, woodwork, metal products, etc. Like other settlements of the time, Meknes was not fortified: walls were not added until the end of the Almoravid period. The town fell into the hands of the Almohad dynasty (1147-1269) at the start of their rule: it was taken by an army led by the caliph Abdelmoumen in person. During this period it was enlarged and urbanized. An inscription states that the Great Mosque was enlarged during the reign of Mohamed Annacer (1199-1213). Water from the Tagma spring was brought to the town to serve the various fountains, baths, and mosques. At that time there were four sets of baths (hammam), the location of which indicates how the town had spread. 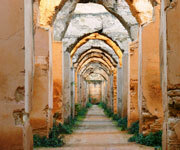 During the subsequent Merinid period (1269-1374) Meknes absorbed the suburbs that had grown up round it. Refugees from the Moorish centres in Andalusia that fell to Christian forces also helped to swell the population, among them a significant Jewish community. Following Merinid practice, Abou Youssof (1269-86) built a kasoan (only the mosque of which survives) outside the old town, as well as the first of the three medersa (Islamic schools) with which the Merinid rulers endowed Meknes. Other public buildings from the Merinid period included mosques, hospitals, libraries, and fountains. The founder of the Alaouite dynasty, Moulay lsmaTI (1672-1727), made Meknes his capital city and carried out many reconstructions and additions, such as mosques, mausolea, and gardens, but his main contribution was the creation of a new imperial city. Built in the Hispano-Moorish style, it is impressive in both extent and construction. lt is enclosed by high walls pierced by monumental gates. Within are the palace with its enormous stables, a military academy, vast granaries, and water storage cisterns. Browse All UNESCO World Heritage Sites in Morocco. The original UNESCO inscription Here!! !